Rabbits are very good at hiding illness, pain and discomfort. Therefore we recommend regular checks to keep them fit and healthy and pick up early signs of ill health. Did you know that a wild rabbit’s territory is equivalent to around 30 tennis courts? Running around such large areas every day keeps wild rabbits fit and healthy, so we need to give our pet rabbits the opportunity to have lots of exercise. Did you know that, unlike cats and dogs, rabbits have only been domesticated relatively recently in Britain? Today they are the nation’s third most popular pet. The biology and behaviour of pet rabbits is very similar to that of wild rabbits, so it’s very important that we understand and consider their natural habitat and behaviour to ensure that they’re as happy and healthy as possible. People don’t realise that rabbits are incredibly social animals and, like humans, they can suffer from loneliness. 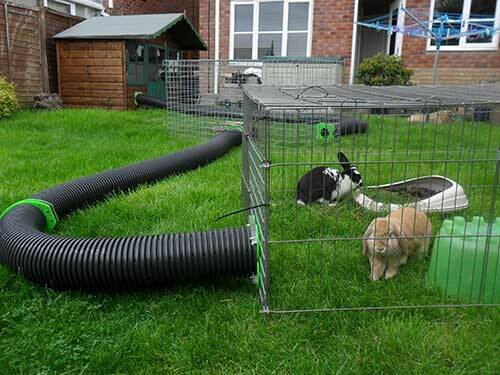 Many owners keep a rabbit alone in a hutch, but this leads to a miserable lifestyle for rabbits. Rabbits have complex social lives and are happiest in company – therefore, rabbits should ideally live in friendly pairs or groups. Did you know that in the wild 70% of a rabbit’s time above ground is spent searching out, or ‘foraging’, for high fibre food such as grass, hay, plants, herbs and bark? 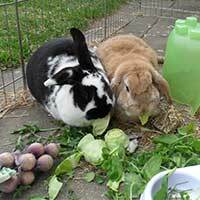 This ‘foraging’ behaviour helps to keep rabbits busy, stimulated and exercised and so the right diet is essential to rabbits’ emotional happiness. Rabbits are Fibrevores. They require high levels of dietary fibre to avoid painful dental disease, obesity, poor digestion and boredom. Your rabbit’s diet should consist of 80% fresh hay or grass, 15% suitable fresh greens, with only 5% dry mix (pellets NOT muesli). This will ensure your bunny is healthy and happy. This will ensure your bunny is healthy and happy. Carrots are high in sugar and should be given in small amounts as a occasional treat. Rabbits require annual vaccination, regular worming and parasite control. 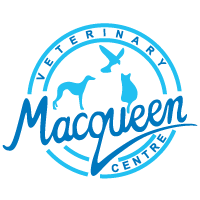 Please ensure you rabbit sees a vet at least once a year for a general health check and vaccination to ensure they stay fit and healthy. 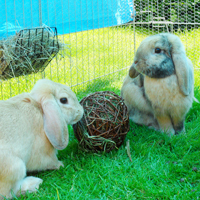 Click here to visit rabbitawarenessweek.co.uk for more information & rabbit health care advice.